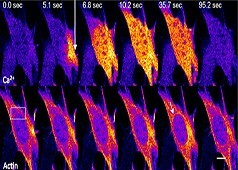 Actin filaments (F-actin) are linear polymers of globular actin (G-actin) subunits and occur as microfilaments in the cytoskeleton and as thin filaments, which are part of the contractile apparatus, in muscle and nonmuscle cells (see contractile bundles). They commonly underlie the plasma membrane and are typically assembled at the cell periphery from adhesion sites or sites of membrane extension. Actin filaments can create a number of linear bundles, two-dimensional networks, and three-dimensional gels, and actin binding proteins can influence the specific structure the filaments will form. This diagram illustrates the molecular organization of actin and provides examples for how an actin filament is represented in figures throughout this resource. Early models for actin filaments were constructed by fitting the filament x-ray crystal structure to the atomic structure of actin monomers [PMID: 2395461](reviewed in [PMID: 3897278]) while more recent models use a number of different approaches [PMID: 17278381]. 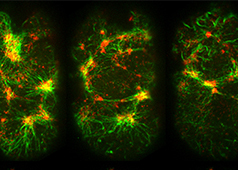 Although a large body of work suggests that F-actin can exist in multiple states, in general, an actin filament has a total rise of 27.3 Å between subunits on adjacent strands and a rotation of 166.15° around the axis . An actin filament is flexible, has a helical repeat every 37 nm, ranges from 5-9 nm in diameter, and has 13 actin subunits between each cross-over point (produced by the ‘crossing over’ of the two long-pitch actin helices) (reviewed in ). An exception is the case of sperm, where a crosslinker protein, scruin, maintains the actin in a coiled state and extends upon activation. In the acrosomal actin rotation angle of one of the strands is 167.15° while the other strand is tilted more than usual to fit into an asymmetric helix . 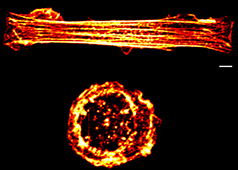 The polarity of an actin filament is visualized by the binding of the myosin subfragment (S1) to the filament, which creates barbed (+) and pointed (-) ends on the filament . 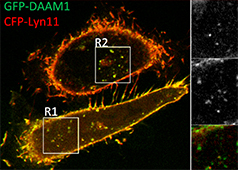 When all actin subunits are bound by myosin S1, the filament appears coated with arrowheads that all point towards one end of the filament . The barbed end structure with bound capping protein has been determined  and polarity ascertained by novel single-particle image analysis methods applied to electromicrographs of in vitro protein preparations . Polarity has since also been determined from cryo-electron tomograms of vitreously frozen cells . The (+) end of filaments generally have a high concentration of F-actin-ATP and denotes the growing end of an actin filament. 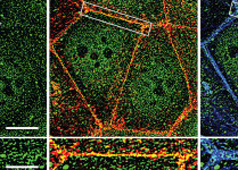 The (-) end generally has a high concentration of F-actin-ADP and denotes the shrinking end of an actin filament. Most actin filaments are arranged with the barbed end toward the cellular membrane and the pointed end toward the cellular interior. 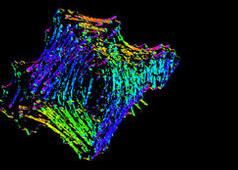 The length of actin filaments can be adjusted by the activity of actin binding proteins and by altering the rate of actin treadmilling.